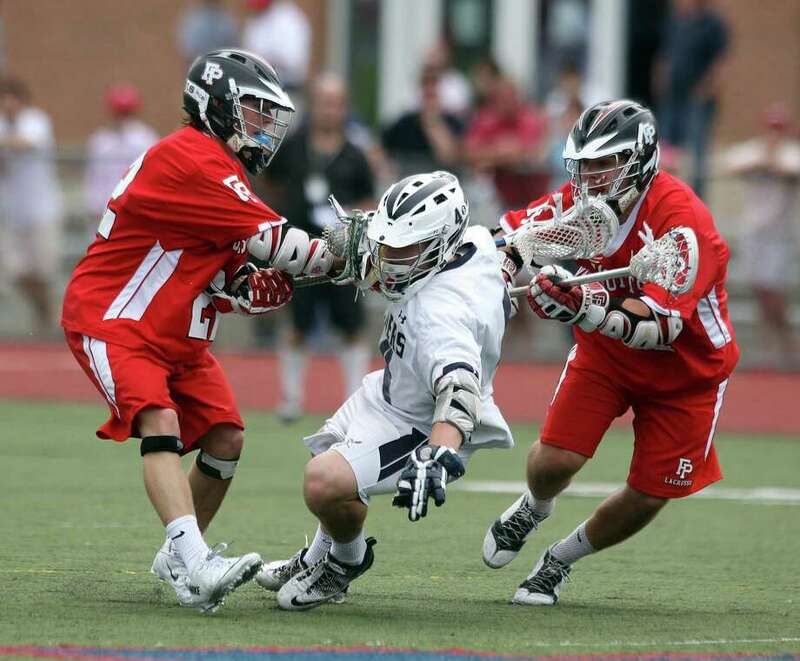 Jared Levi's faceoff prowess was frustrating the Fairfield Prep boys lacrosse team. With the Jesuits down, and their dream of a state championship hanging in the balance, their coach channeled the spirit of the mid-1990s Philadelphia Flyers. And thanks to its version of the "Legion of Doom," Prep can call itself Division L state champions again. The fourth-seeded Jesuits scored nine unanswered second-half goals, claiming their second straight state title, 14-8, over No. 3 Staples at Norwalk's Casagrande Field. Tim Edmonds and Burke Smith each scored three goals, and Kevin Brown and Sean Henry each netted two, as Prep finished unbeaten against Connecticut opposition and claimed its sixth state championship in eight years. "Every opportunity to play for a state championship is different, because you have a different team," Prep coach Chris Smalkais said. "We haven't recruited, or bought, or traded or acquired these guys through free agency. They come to Fairfield Prep to play lacrosse, and I think we've developed a pretty strong lacrosse culture." Joey Zelkowitz and Colin Bannon each scored three goals and had an assist. The Wreckers finished 16-5 but claimed their own championship, according to head coach Paul McNulty. "We beat Simsbury the other day, and I think that's for the public-school championship of Connecticut," McNulty said. "Prep is very good, they have a very good coach and they have a lot of good players. But we have a medium coach, and a lot of good players, and they all live in the same town." Still, Levi's faceoff dominance and the Wreckers' efficient offense allowed them to dream of the actual state crown for nearly three quarters. After leading 5-4 at halftime, Staples scored the third-quarter's first two goals, building a 7-4 advantage on Zelkowitz's goal with 5:50 to play. "We executed our game plan very well," McNulty said. "To keep it at our end of the field, and hopefully, keep it off the clock and get a goal." That goal inspired Smalkais to call timeout and switch long pole Andrew Hatton to faceoff X and use long-pole defenders Riley Hoffman and Strecker Backe as support. "I decided to use the `Legion of Doom,' which is the three long poles in the midfield," Smalkais said, adding that he named the unit after the mid-1990s Flyers line of John LeClair, Eric Lindros and Mikael Renberg. "It was pretty effective to spark that run." The "Legion" did not lose a draw from there, and though Austin Sims and Bannon traded goals. Hoffman's marker 10 seconds after Bannon's started a run of three-straight goals that drew Prep even at 8 after three. "All I had to do is scrap for the ball and check it out of his stick and get wing play to help me out," Hatton said, "and they picked up half the balls when I was at the X." That faceoff dominance enhanced Prep's run to nine, with six coming in the fourth quarter. Smith, David White, Brown, Edmonds and Henry each scored fourth-quarter goals, with Smith netting two, as Prep held the ball for much of the frame. "Having possession is everything," Edmonds said. "We started getting the ball, kept our composure and feeling good about ourselves and started burying chances." Staples' start was exactly what it was looking for. The Wreckers scored four of the first five, three of which came from Zelkowitz. "We just had to keep executing what we had planned," McNulty said. But White and Edmonds potted goals that cut Prep's deficit to 4-3 after one quarter. The teams traded second-quarter goals, as Staples had a halftime lead thanks to six first-half saves by Cole Gendels. "I thought we were really flat to start the game," Smalkais said. "Hats off to Staples, (McNulty) and his coaching staff have done a great job." Records: Fairfield Prep 18-3; Staples 16-5; Scoring: FP-- David White (2g, 3a), Tim Edmonds (3g, 1a), Burke Smith (3g), Kevin Brown (2g), Sean Henry (2g, 1a), Austin Sims (1g, 1a), Riley Hoffman (1g), John Edmonds (1a); S--Joey Zelkowitz (3g, 1a); Colin Bannon (3g, 1a), Will Johnson (1g), Jon Pacilio (1g); Goalies: FP--Connor Henry (5 saves); S--Cole Gendels (9); Shots: FP--31, S--25.